Air Pod Presses | Platen Presses | Black Bros. The Black Bros. Air Pod Press uses air operated platen presses that are commonly used for stack-laminating “sandwich-type” assemblies such as flush doors, table tops, furniture parts, insulating panels, etc. Today’s improved close tolerance stock with uniform thickness and surface smoothness eliminates the need for the high pressures previously required to bring face and core stock surfaces into bonding contact. Black Bros. Air Pod Presses apply uniform pressure over the entire platen area for strong, high-quality bonds, and increase production of same size panels compared to one-at-a-time systems. Platen sizes are available from 2′ x 4′ (610 mm x 1219 mm) to 5′ x 12′ (1524 mm x 3658 mm). Presses are available in: end or side loading styles; with manual or motorized height adjustment; 10, 50, and 80 psi (69, 345, and 551 kPa) models. Normally, two or more presses are used to provide continuous production output. 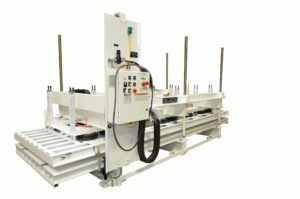 For Extra large laminating, such as SIP Panels or Van Trailer, Air Pod Presses can be configured together to create very spacious platen areas. The largest APP built by BBCO to date is a 12′ x 54′ Press.